Provide comfort for the family of Gladys Watkins with a meaningful gesture of sympathy. 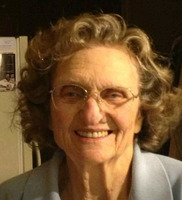 Gladys Mae Banks Watkins, 90, a homemaker, passed away on Monday, March 18, 2019 after a sudden illness. Visitation: 6-8 p.m. Thursday, March 21, at Wade Family Funeral Home, 4140 W. Pioneer Parkway, Arlington. Funeral: 11:00 a.m. Saturday, March 23, at First Baptist Church, 2 S.E. Jefferson St., Idabel, OK 74745. Gladys was preceded in death by her mother, Bessie Banks; her father, Luther Banks; her brothers, Durwood Banks and Earl Banks; and her sister, Evelyn Hartsell. Survivors: Husband, Charles Watkins; daughters, Charlotte Jones and Karen Reed; brother, Jerry Banks; granddaughters, Dawn Turk, Kristi Bailey, Nicole Gray and Whitney Bruner; 8 great-grandchildren; and a host of nieces and nephews. To send flowers in memory of Gladys Mae Watkins, please visit our Heartfelt Sympathies Store. Provide comfort for the family of Gladys Mae Watkins by sending flowers. May the family of Gladys Mae Watkins please accept my sincere condolences hoping you find comfort in God's words at Acts 24:15 and Psalm 37:29.